We’ve all been there — multiple team members spend countless hours working on a big story, only to be let down by low traffic and engagement with your audience. Capturing maximum attention from viewers can be tricky. The best strategy? Making a social media plan that spans across multiple days and platforms. While there is no hard-and-fast rule for what works best, the initial Facebook post for “Seeds of Hope” resulted in 1,191 click-throughs to the story, while the last post only received 315. Try using Google Sheets to create an interactive calendar for your planning purposes. Sharing the calendar with team members will reduce scheduling mishaps and over-posting. Facebook is by far the most developed and robust platform, with lots of built-in analytics and features to take advantage of. By posting on Facebook, the UW was able to generate over 500,000 views, 130 comments, 300 shares and almost 3,000 likes, all within the first few days. Keep in mind that different types of content will result in different reactions, so it is important to continually look at analytics and tweak your content accordingly. 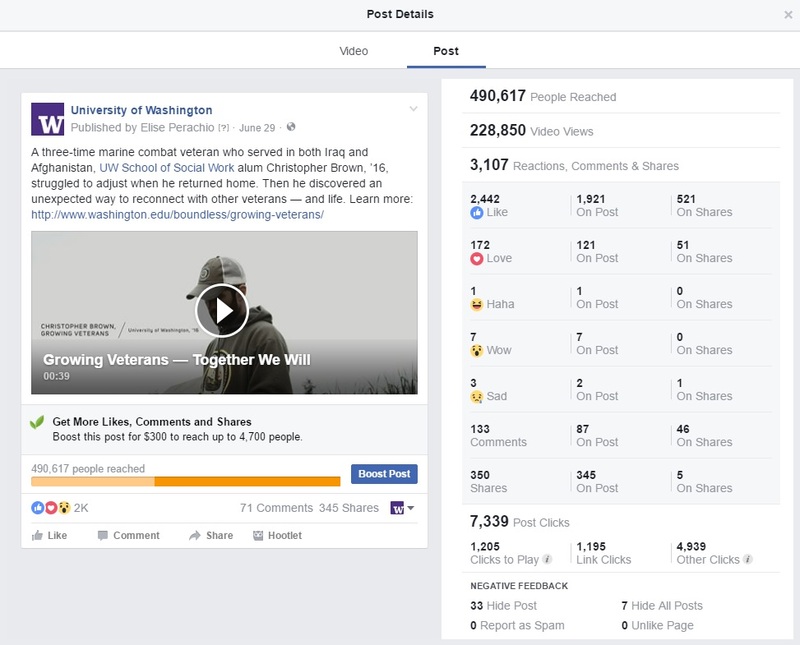 For example, the UW had more shares on the post that featured only photos, but more engagement and click-throughs on the post with an embedded video. If you are planning more than one Facebook post, make sure you take advantage of the platform’s versatility. Make each post a different length, and feature something new each time, like a photo or link — then see how it performs. Tweets should provide a captivating peek at what you are actually linking out to. For this story, hashtags were chosen to capture the attention of users with a specific interest in the story’s topic: Both #trauma and #ACES (American Council on Education) resonate with those knowledgeable about veteran recovery. Doing so will make them more likely to retweet to others in their community, thus increasing the overall reach of your story. To increase the likelihood of your tweet being seen, be sure to include an image, graphic, gif or link to a YouTube video. Lastly, check Twitter guidelines for the photo sizes that will work best. For example, embedded photos should be no larger than 5 MB; otherwise you will have to link out. 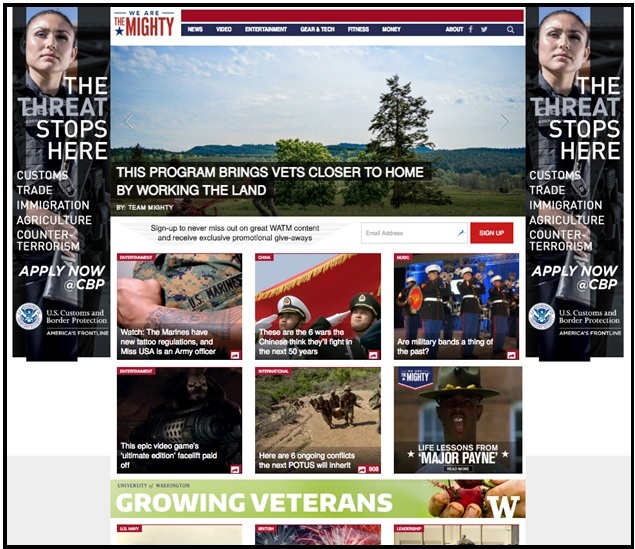 “Seeds of Hope” was also featured on We are the Mighty, a website that caters to military communities. In addition, the Growing Veterans website currently features a link to the story. This strategy is at the intersection of PR and social media, and often gets overlooked. And if you think that your story could be a good fit for platforms like Pinterest or Vine, consider those as well! With social media, catering your post to the audience you want to reach will yield better results than only sharing on broad-reach platforms. Cohesiveness is key to a successful social media campaign. Do you have a central website to link to? Is it optimized for viewing via mobile devices (which is what the majority of people are using when they’re on social media channels)? Do your posts reflect the same goals? The strategies that were used to promote the Growing Veterans campaign led to one of the most successful immersive stories to date for University Marketing & Communications. However, don’t limit yourself to only using social media campaigns for big stories; smaller stories can have big impact as well, as long as people are able to find them and are moved by them. A little extra planning will go a long way to increase the amount of people who see, hear and engage with your story.